A street entertainer works his magic on the children. I think Elly needs more puff! 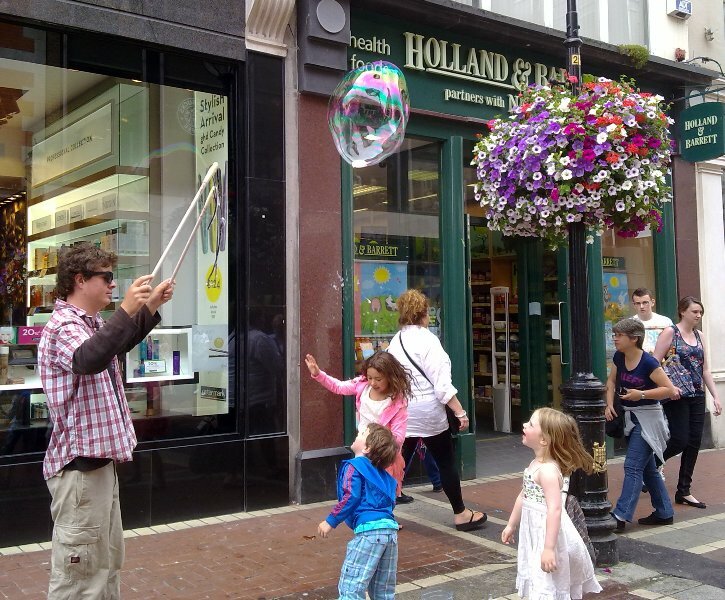 This entry was posted in Uncategorized and tagged Bubbles, Elly, Grafton Street, Photography, Street Entertainer. on August 27, 2013 by Grannymar. What exactly are those white things he’s waving? 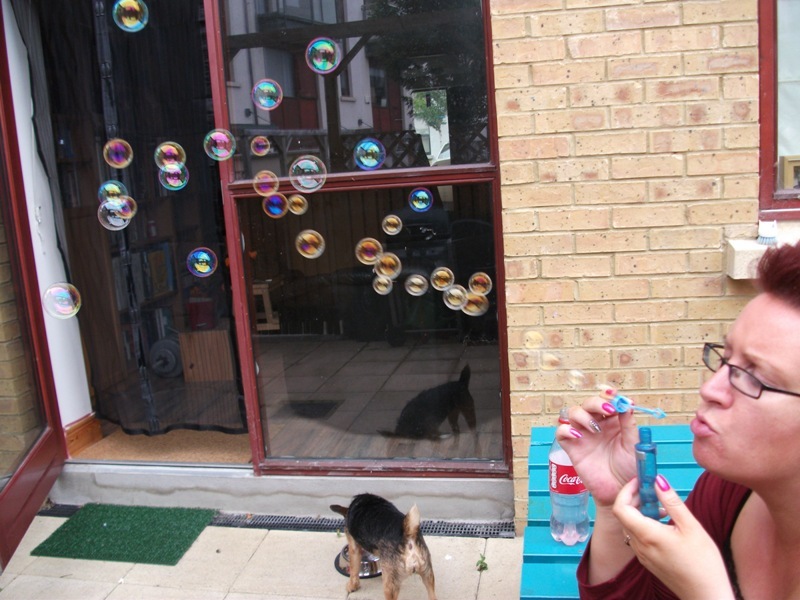 And Elly seems to be blowing an impressive array of bubbles. Plenty of puff if you ask me! The guy was using a short rope with two handles, like those of a diablo. to make the large bubbles. My Elly has plenty of ‘puff’ I was teasing! pretty bubbles. 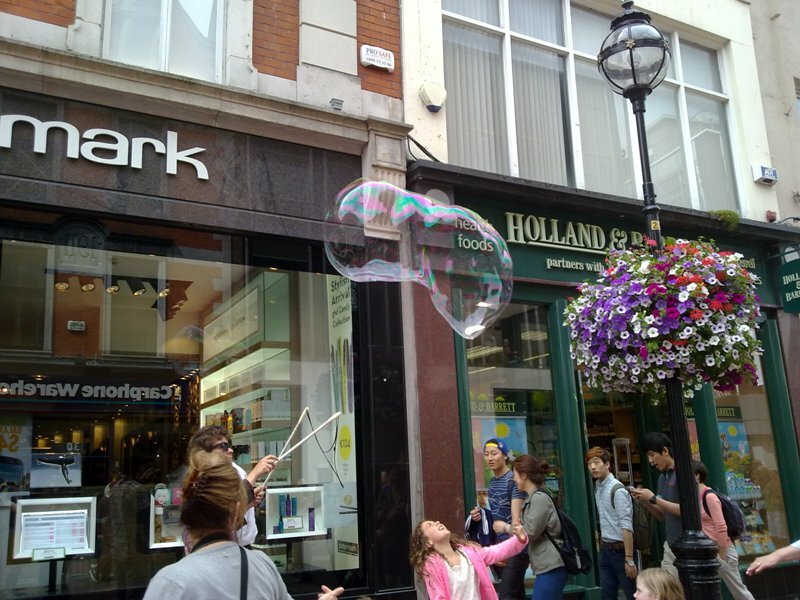 I recall many happy memories blowing bubbles. Gigi, I loved blowing bubbles and trying to catch them when I was a child. Dianne, I might join you. Do you think that Chinese bloke is texting his mum in China about the “blubbles” ? John, I never thought of that. Bubbles have the giggle factor! If you bust open a glow stick and pour it in the bubble bottle you can blow glow in the dark bubbles! Always have bubble blowing materials on hand here, never know when the need will arise. It’s fun! Oh! I must try that! Right now? Buffy is sitting beside me. Everyone else is asleep! In the photograph to the right of Elly.